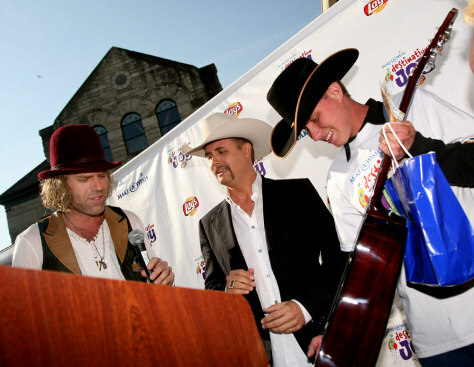 In this photo made available by Make-A-Wish Foundation of America, Big Kenny Alphine, left, and John Rich, center, also known as the country duo Big & Rich, welcome Make-A-Wish kid Brian Johnson, right, of Whitehall, Mont. to Nashville, Tenn. and present him with an autographed guitar. Brian's wish — to attend CMA Music Festival and meet his favorite country music artists — coincides with the launch of a new Make-A-Wish campaign.